Copyright resides with the original holder. No reproduction without permission. Thanks to Kevin Lakin for making this camera script available. ‘Bird of Prey 2’ was the sequel series to the 1982 conspiracy thriller of the same name. 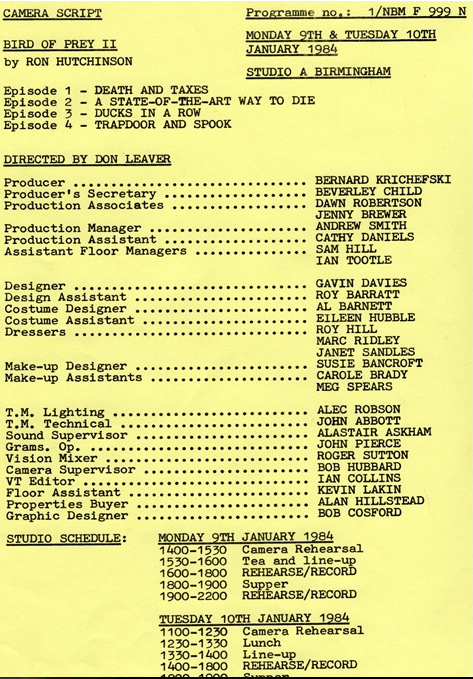 The series was written by Ron Hutchinson and produced at Pebble Mill, being transmitted in September 1984. It was a four part series about computer fraud, recorded in Studio A. The series featured: Richard Griffiths as Henry Jay, Carole Nimmins as Anne Jay, Lee Montague as Roche, Jan Holden as Mrs Lucas and as Timothy Bateson as Mr Jorry, and Bob Peck as Greggory. 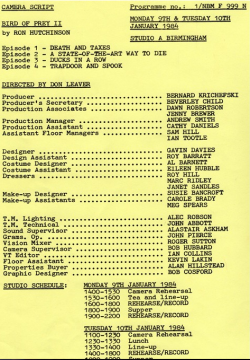 As you can see on the camera script, the series was directed by Don Leaver and produced by Bernard Krichefski.